A chunky knit is a must have for A/W! It was probably the easiest choice for me, because I love oversized jumpers. I bought mine from Dorothy Perkins for £22 and I am in love! It is very soft and perfect for colder weather. 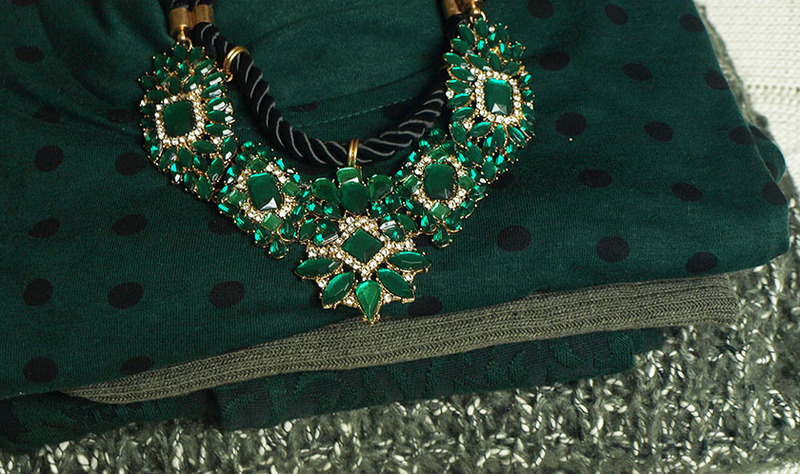 I am wearing it with the green leggings and a gorgeous green statement necklace. I will get a lot of wear out if this jumper. I can wear it with jeans, leggings, dresses, skirts. Anything really. To be honest, I don't 'go out', because I hate clubs and pubs, so... I decided to go for an outfit I would wear to a dinner in a restaurant. The dress is a Primark bargain and it costed me £5.00!!! 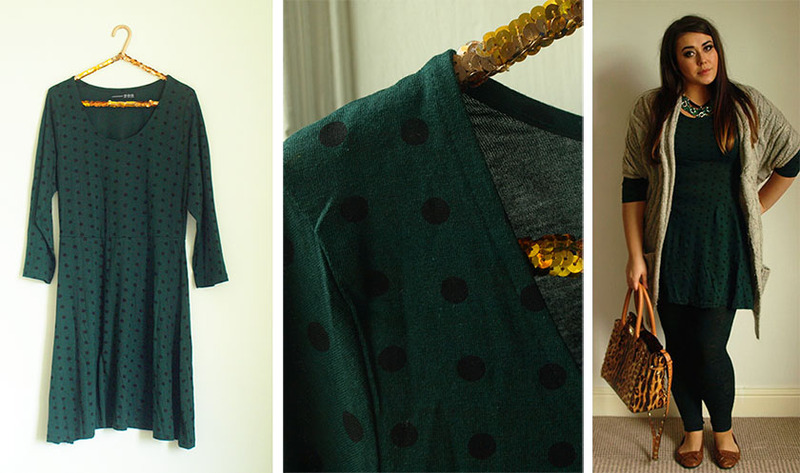 It's a dark green colour with black polka dots and the skater shape is very flattering. 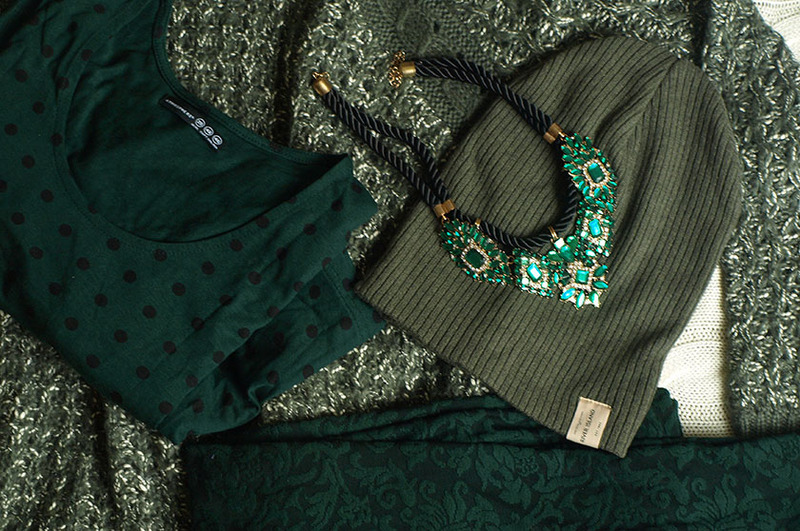 It isn't the best quality, but if you want to add some green to your wardrobe this Autumn, it is a great option. I am wearing the dress with a grey short sleeved cardigan and leggings. Again, I am wearing the green necklace. I work from home, but if I had to pick something comfortable to wear to work, I would go for a shirt. 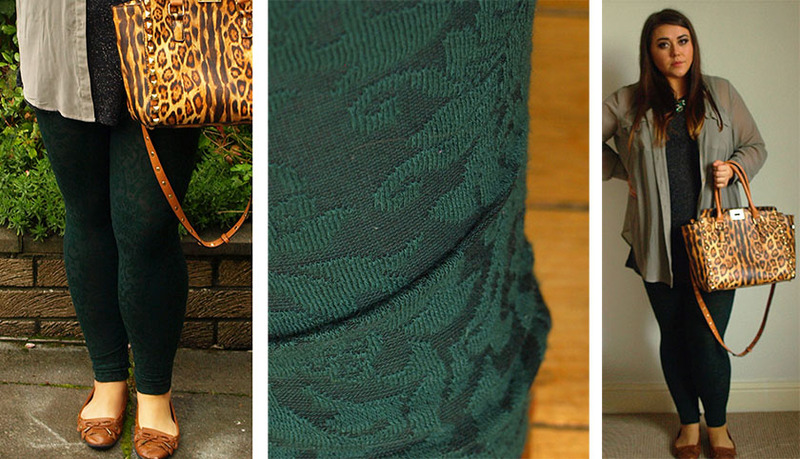 I am wearing it with a dark grey vest top and beautiful Dunnes leggings with a gorgeous floral pattern. They were only £10.00 and I can't stop wearing them. The colour and texture are very A/W appropriate and as you can see, I chose them for every single outfit. They are beautiful! 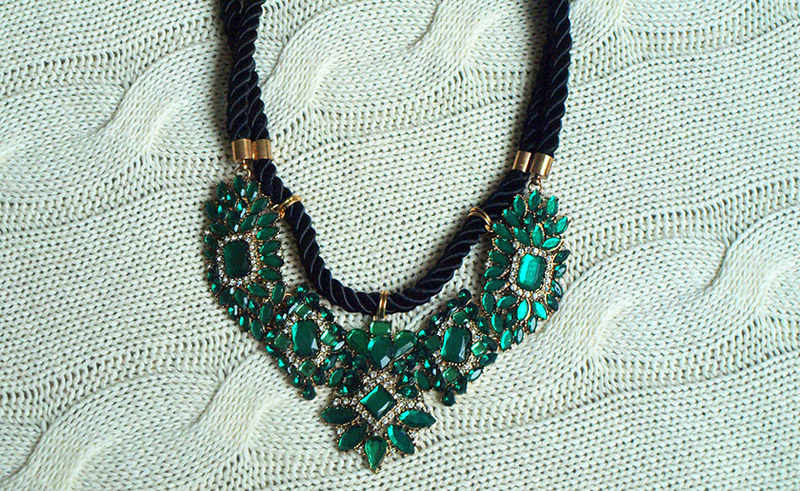 I am obsessed with accessories, especially statement necklaces, so I had to pick some up for this challenge. 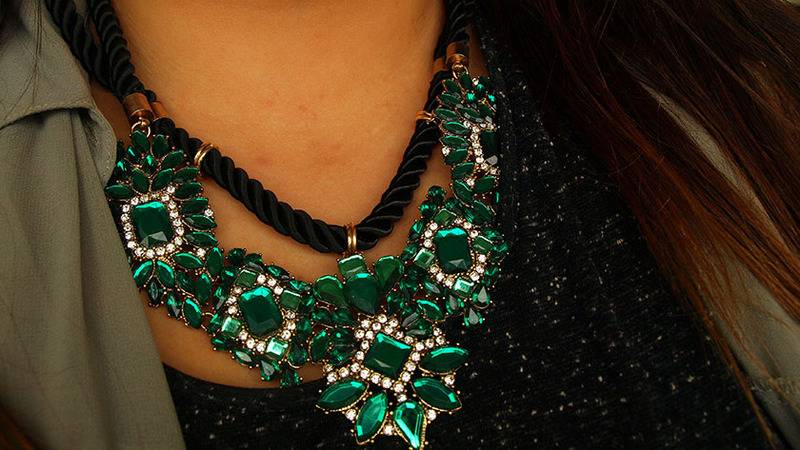 First of all, the gorgeous New Look necklace (£14.99). Oh my... It is perfect and I can't stop staring at it. It is limited edition, so be fast if you like it. I also picked up a studded camo scarf from Primark for £3. It is an easy way to update your A/W wardrobe and very cheap too. The last accessory I decided to buy is a beanie from River Island. It is from the mens section, but I really liked the colour. It was £8.00. 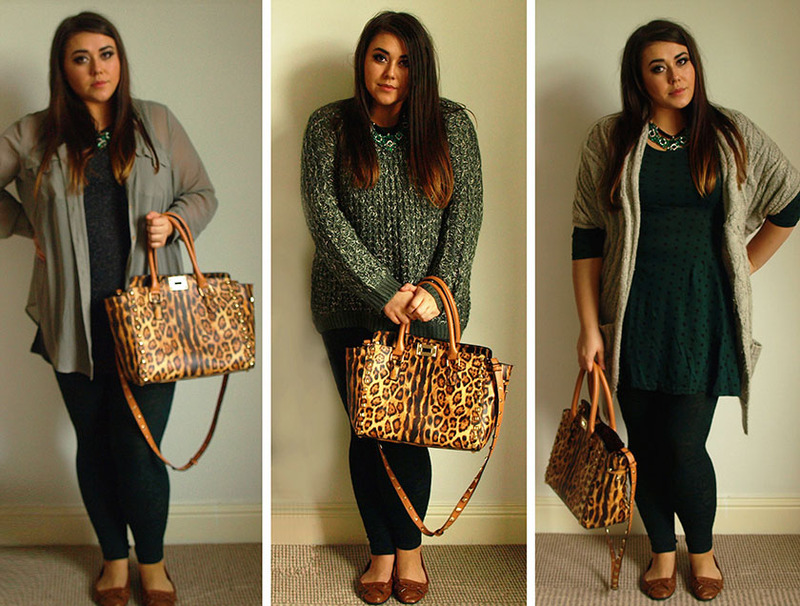 I am currently obsessed with my Leopard Print Bag and I decided to wear it with all the outfits. I think it goes with green really well. For the shoes, I chose comfy, brown Primark loafers. I want to get more use out of them, before the weather becomes unbearable. On a very chilly day, I would wear all the outfits with my green parka jacket. PS. The left corners of the photos look a bit dodgy, because I had to cut out my sons legs out of the photos, haha. He decided to lie on the floor and refused to move! I can't get a minute alone. Also, please excuse the quality of the outfit pictures - my husbands hands are very shaky. Can I get a professional photographer for all OOTD posts, please?